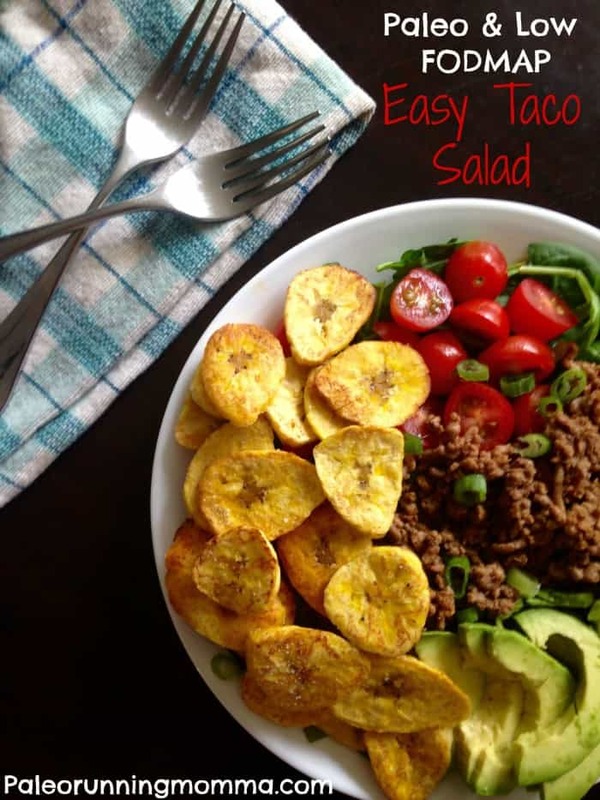 A super tasty paleo & low FODMAP easy taco salad to add into your dinner rotation! 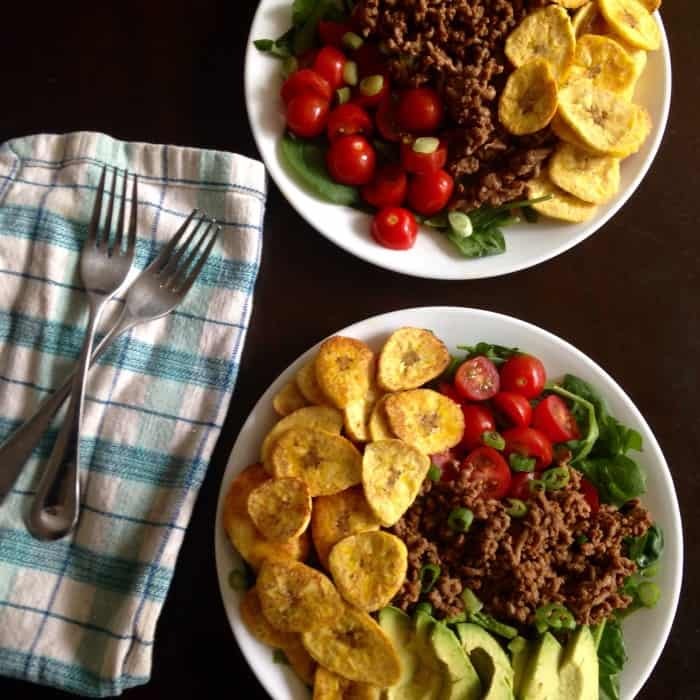 Fresh greens are topped with simple spiced ground meat, tomatoes, avocado, and plantain chips. 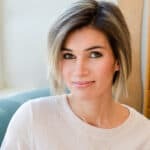 A low FODMAP diet does not have to result in the sacrifice of flavor! 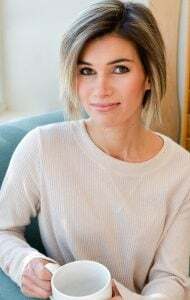 I’ve noticed that my recipes have gotten much simpler as I’ve realized that 1) It’s not realistic to attempt to make elaborate meals 6 or 7 days per week and 2) You can eat tasty and healthy low FODMAP and paleo meals without a lot of fuss. Look, aren’t we fussing enough? Especially when children are involved? Just to put plates out and cut raw veggies into thin strips while screaming “clean up and set the table” is quite enough for me at the 6pm hour, and that does not take cooking into account at all. Besides less chaos, fewer ingredients also means less to buy at the store and less $$ spent. Not that onions are expensive or anything, but now you can see how I rationalize things when I need to. I probably spend too much energy rationalizing, now that I think of it. Let’s just say this would be delicious either way, and simple can be a very good thing! As for the plantain chips, I have to admit that I used my plantain chip recipe for this salad, but to make this truly quick and easy you can absolutely use store bought plantain chips from Whole Foods, Trader Joe’s, or any other market that sells them without a lot of added junk. But, if you have an extra 30 minutes one day and can get a couple of green plantains, definitely try the chip recipe! They’re really a treat all on their own. 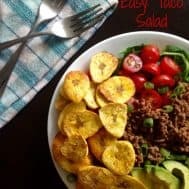 A paleo and low FODMAP easy taco salad using your choice of ground meat mixed with simple spices along with fresh greens, tomatoes, avocado, green onion, and plantain chips! To make the taco meat, heat a large heavy skillet over medium - medium hi heat and add your cooking fat. Once the pan is very hot, add the ground meat and break up lumps with a wooden spoon so it cooks evenly. Add the spices and salt and cook a couple of minutes, stirring, until browned. Remove from heat. 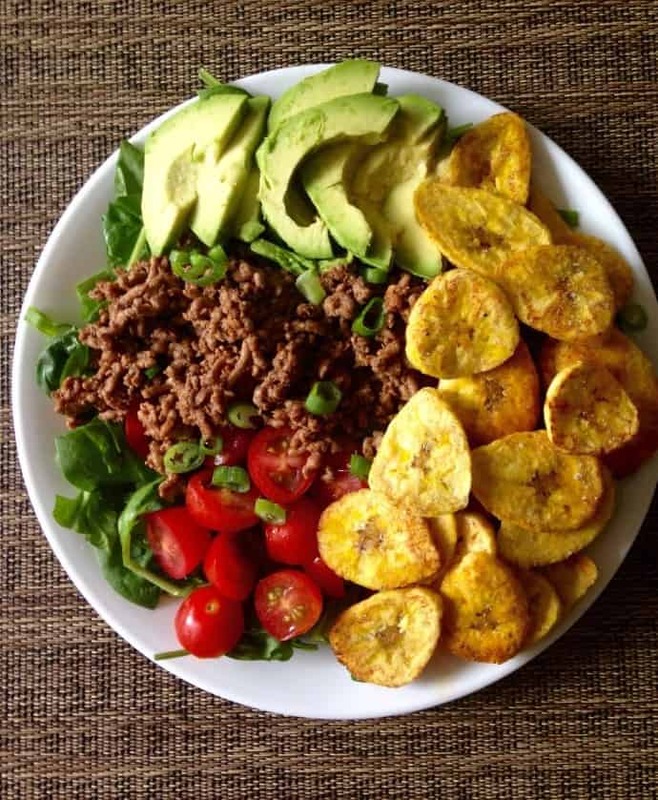 To arrange the salads in either bowls or plates, add the greens first, then 1/4 of the taco meat, 1/4 of the tomatoes, 1/4 of the avocado, sliced, plantain chips, and garnish with sliced green onion. 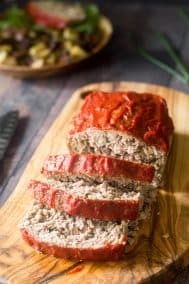 Now sit back and enjoy this easy and delicious meal! Aw, look at that – it’s like date night except Adam wasn’t coming home for another 2+ hours. But his dinner DID look pretty (even sans avocado since he dislikes) and he is always very happy with reheated food. Not that I would know about it if he wasn’t, of course. Unless it’s salmon, remember that? How How many times per week do you go “all out” with dinner? How often do you opt for super quick meals? 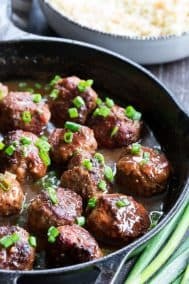 What’s your favorite quick or “semi homemade” healthy meal? I go through phases but I’m currently in a simple is best phase! I didn’t eat avocado for so long too. Truth is I had no idea how to cut it open and get the pit out. Thank goodness for the internet! Lately I have been all about the simple meals. I used to make something similar but I have forgotten about it. I’ll need to add it back into the rotation! The pictures did come out well! I make a sort of taco salad often with TVP for a quick lunch. And I had plantain chips last night 😀 So I would say that we have very similar tastes, lady! Lately with the salt, I can’t get enough! Definitely next time 🙂 I’m pretty bad with meal prep, but once the school year kicks in and I have less time around dinner I’ll have to be a bit more organized. I am all about simple meals! Not only am I just cooking for myself and have no one to impress, but also everything pretty much tastes great to me anyways. I’m on a kick right now where I half a red bell pepper and put it in the oven for 10 minutes then I fill it with browned beef or turkey and top it with a vegetable and “pasta” sauce. Hm.. now that I say it out loud it sounds weird, but it tastes delicious! That sounds good! I wish my kids would eat cooked peppers – they love raw but not cooked or stuffed. 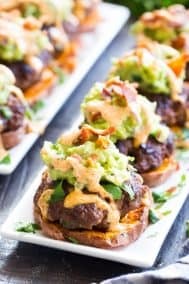 These look delicious and deceptively “easy”! I think leaving the all-out prep to a few times a week is best especially in warmer months when we all feel like cooking less. 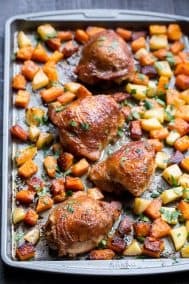 Ugh I never go “all out”… maybe once a week if my boyfriend and I are cooking, but on my own, I usually prefer smaller meals for dinner and therefore stick to the quick/easy options. I am all about plantain chips recently though! 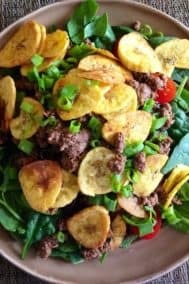 Plantain chips have such great flavor and are easy to get hooked on, especially when we need/want our salt! You put taco in the name, and I’ll eat it. This looks so so good! I haven’t tried plantain chips yet, but I keep meaning to! I never go all out for meals these days, my all out is still under 30 minutes! I love throwing greens, nuts, and avocado in the blender with spices. It’s a dip, soup, or sauce and it’s giving us the greens and fats. Yay! I hear you on the “all out” still being under 30 minutes 🙂 You are the master of sauces and dips, yum! Now that my mother is here I’m realizing how hard it is to cook every night for more than one person. I’m not sure why either, but I’m always in charge of meals. The other night I was like eat what you want. I’m not cooking. I really hope to find a man someday that can cook for me and not depend on me for all his meals. By the way, are green plantains better for frying? Woah that combination seriously makes my mouth water! I can literally takes the crunch and creaminess of the ingredients. There are just so many directions you can go with a salad, love your paleo twist on this one! This looks delicious! I love healthy tacos salads and it’s been a while since I’ve made one. I tend to make a few all-out dinners a week, and then I just get nights where I make eggs, vegetables, and sweet potatoes and call it brinner. i love taco salads ! i usually add a “dressing” of salsa (there is a great mild one at my store that has a little pineapple in it) and sour cream/greek yogurt. or even some ranch dressing. i also sometimes add other veggies like carrots or celery just depends what i have on hand. my BF loves it with some black beans as well and i admit we both use it a vehicle for cheese. but u know…u raise an EXCELLENT point. why does dinner have to be so complicated ? its like the complicated things sound awesome when i am planning them as if i have all the time in the world but then when it comes to cooking them at 7pm i am like what was i thinking ????? i have been toying with simplifying more. i think i need to do it. especially in the august heat. who wants to cook more than they have too ? leftovers all the way ! I’m a mild salsa person too, I can’t do super spicy anything. I’m the same way with planning meals – when I think ahead they are overly complicated with so many steps, but lately I’ve just been winging it and doing what’s easiest. My family tends to like the easy meals better anyway! 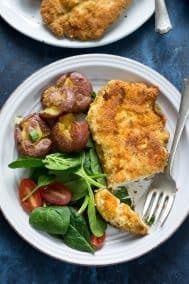 Week night dinners should always be simple and quick to prepare – it doesn’t mean at all that they’re boring or tasteless! With the right ingredients and herbs/spices you can pep up anything. Plaintain chips are still on my to-make list!! If I were cooking only for myself I might eat the same meal 3 times a day 7 days a week! I have my kids to insist on variety, at least for dinner! I hear you – I go through phases! Taco salads are easy and good! 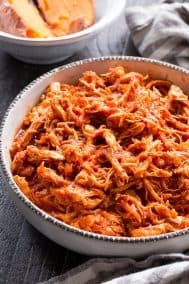 This looks delicious and makes me want a taco salad: I’m thinking cabbage (because I have two and half in my fridge right now!! ), beans, cheese, avocado, onions, and tomatoes. Maybe I’ll even defrost some meat for the Hubby’s. As for the dinner during the week debate, it has to be easy and simple or else I’m doing it. I’m generally exhausted by the time I leave the office and it’s often late so I need to come home and have parts of it ready to go or else I’m opting for a smoothie or a bowl of cereal for dinner. This looks amazing! 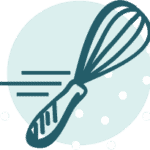 I’ve been trying a lot of new recipes since I downloaded the new FODMAP Friendly app. It shows the amount of FODMAPs in each food, so I can try new recipes while still staying on track. Do you have this app? I make tacos all the time, so I’m excited to try this recipe 🙂 Thanks for sharing!